Permutation betting, or combination betting as it's also known, is similar to betting accumulators and multiples, because it involves placing wagers on multiple selections. There's a significant difference however, in that you don't need all your selections to be correct to get a return. Accumulator and multiples are individual wagers which contain multiple selections, and they only return a payout if every selection is correct. Permutation betting is the placing of a series of wagers which covers multiple selections in various different combinations, meaning you can still get a return even if some are incorrect. To fully understand how this form of betting works, you should ideally be familiar with accumulators and multiples. If you're not, you should read the following article before continuing on. In this article, we explain permutation betting in more detail, using examples and providing information on the various combinations that can be placed. The basic idea of permutation betting is to maximize the chances of making a return when backing multiple selections. It's a way to still benefit from the higher payouts that accumulators and multiples offer, without being exposed to the risk of losing your entire stake if just one of your selections loses. You do this by covering your selections in different combinations. Rather than placing one wager on all your selections, you would place a number of wagers. Let's say you pick four selections. We'll call them A, B, C, and D. You could place an accumulator on all four, which means you'd need all four selections to be correct. 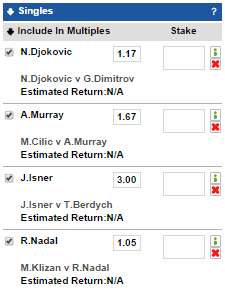 Alternatively, you could bet on all the different doubles (A & B, B & C, C & D, etc. ), and all the different trebles (A, B, & C or B, C, & D, etc.). By taking this approach, you would only need two of your selections to be correct to guarantee a return, because you would at least win one of your doubles. This is essentially the point of permutation betting, to reduce the overall risk of betting on multiple selections. The best way to fully explain permutation betting, and the benefits it offers, is to use some examples that show how it works in practice. Our first example is based on wagering on the following two soccer matches. If you thought both these matches would result in home wins, you could place a double on Swansea and Liverpool. Let's say you did just that with a stake of $30. If both teams did win, you would get a return of $77.70 including your stake for a profit of $47.70. This payout is based on odds of 2.59, because the odds of both your selections are multiplied for a double. This is the big advantage of backing both teams in the one wager; you get an increased payout due to the odds of the two selections being multiplied. The disadvantage is that you have to get both selections correct. If one of them loses, you get nothing. Now let's say you decided to cover both selections using permutation betting instead. You would place a total of three wagers: a single on Swansea to win, a single on Liverpool to win, and one double. We'll assume you risk the same amount and stake $10 on each of the wagers for a total of $30. If both teams won, you would win all three of your wagers with the following payouts. Your total profit here is $28.40, which is obviously less than you would have received had you simply placed $30 on the double. However, if only one of the teams wins, you still get some of your money back. You've sacrificed some of your potential returns in exchange for risk reduction, which is basically the main appeal of permutation betting. Permutation betting gets a bit more complicated when it involves more selections, primarily because you have more options. Let's take a look at an example where you've entered four selections on your betting slip. You could place an accumulator on these selections. Alternatively, you could spread your risk through permutation betting. The following options would be available to you on your betting slip. As you can see, you've got the choice of covering the singles, doubles, and trebles, as well as the fourfold accumulator. The great aspect of using an online bookmaker for these types of bets is that they will automatically work out all the combinations. So if you wanted to bet $10 on all the possible doubles, you'd just enter $10 in the box next to doubles. It shows you that there are six doubles in total, so this would cost you $60. If you also wanted to bet $5 on all the possible trebles, you'd just enter $5 in the box next to trebles. With four in total, this would cost you another $20. This highlights a major benefit of permutation betting; you can spread your risk however you choose. You can easily choose to bet more on the doubles than the trebles, or vice versa. You could put most of your stake on the fourfold to maximize your potential return, with just some smaller amounts on the doubles and trebles to provide some insurance in case one or more of the selections fails to win. There's a simpler option, too. You'll see there are a couple more options on the betting slip; Yankee and Lucky 15. 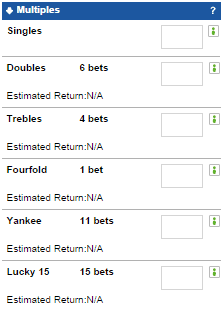 A Yankee automatically covers all the doubles, trebles, and the fourfold with an equal stake on each. So a $10 Yankee would cost you $110 in total: $10 on each of the six doubles, $10 on each of the four trebles, and $10 on the fourfold. This is known as a full cover bet, as you are covering all the possible combinations. The Lucky 15 automatically covers everything that the Yankee does, with additional wagers on each of the four singles. This is known as a full cover with singles. There are several different types of full cover bets you can place, depending upon the number of selections. The following table shows all of them, with a breakdown of what they cover and the total number of bets they include.